Shane is here to help businesses in their quest to navigate the thicket of federal government contracting, with a focus on those issues affecting small businesses. He excels in drafting both transactional and litigation documents and advising clients on FAR and SBA contracting rules, skills that come in handy in solving the riddles of government contracting. Shane is experienced in numerous litigation matters including bid protests before GAO; size and status protests (including SDVOSB status) before the SBA area office; size and status appeals before SBA OHA; contract administration issues with contracting officers; and claims appeals. In the transactional world associated with federal government contracts, he has worked on joint venture agreements, operating agreements, subcontracts, teaming agreements, and other documents. Shane also provides insights to contractors into matters that might arise in areas such as cost principles, DOL wage classification appeals, limitations on subcontracting, and affiliation. In this endeavor, he draws on his years of work with a boutique law firm specializing in debtor-creditor issues. In that position, he advised clients on small business issues, financial matters and how to run through the gauntlet of government-sanctioned review. He has litigated numerous issues of state and federal law before federal courts, with issues ranging from real property law to interpretation of loan documentation and divorce decrees. 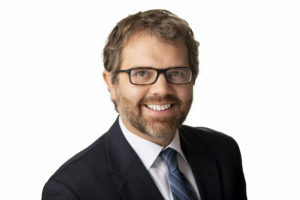 While at the University of Kansas School of Law, Shane served on the Kansas Law Review as the Symposium Editor and was a member of the Moot Court Council. Shane also served as judicial intern for Judge Dale L. Somers of the United States Bankruptcy Court for the District of Kansas while in law school. Prior to law school, Shane served as a Peace Corps volunteer for two years in Jamaica and received a master’s degree and undergraduate degrees from the University of Kansas. Shane is a fan of both Lawrence, Kansas, and the University of Kansas Jayhawks sports teams. He is such a fan of Lawrence that he came back from the sunny shores and Blue Mountains of the Caribbean to live in Lawrence. He usually spends his free time with his wife and two kids and can often be found strolling downtown Lawrence, playing soccer, or camping. Shane can be contacted by telephone at (785) 200-8919 or by email at smccall@koprince.com. “How to Comply with the Rules on Ownership Changes and Maintain the Business’ Socioeconomic Status and Contracts.” Contract Management Magazine, 2019. “SDVOSB Regulations Reveal Typo in Exceptions to Ownership Conditions.” SmallGovCon, 2019. “2018 NDAA: Changes to the HUBZone Program.” SmallGovCon, 2019. “COFC: False Information in SDVOSB Application Proper Grounds for VA Removal.” SmallGovCon, 2019. “Recent SBA OHA Decision Offers NAICS Code Appeal Guidance.” SmallGovCon, 2018. “NAICS Code Appeals: Infrequent, but Often Successful.” SmallGovCon, 2018. “‘Using’ an Affiliate’s Past Performance: GAO Explains the Test.” SmallGovCon, 2018. “GAO: Email Delivery Receipt Didn’t Confirm Proposal Submission.” SmallGovCon, 2017. 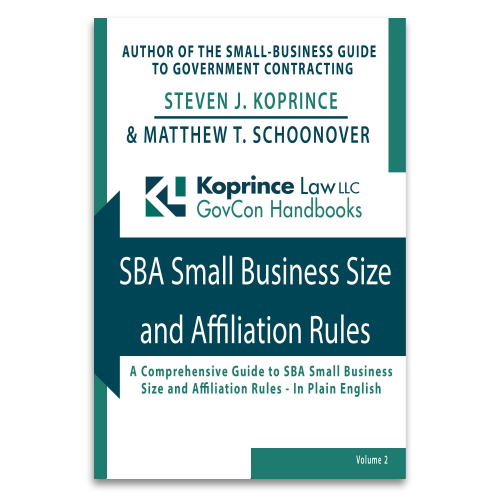 “Federal Court Interprets SDVOSB ‘Unconditional Ownership’ Less Strictly Than SBA.” SmallGovCon, 2017. “At CBCA, Small Claims Procedure Nets Winning Claim for Extra Work.” YouTube, 2018. “NAICS Code Appeals: Infrequent, but Often Successful.” YouTube, 2018. “‘Using’ an Affiliate’s Past Performance: GAO Explains the Test.” YouTube, 2018. “Is an Email Receipt Sufficient?” YouTube, 2017. “Bottom-Line Price, Not Line-Item Price, Is Key for Price Reasonableness.” YouTube, 2017. Successfully protested evaluation of award at GAO based on failure to properly analyze subcontractor and prime contractor responsibility for past performance and evaluation of contractor qualifications issues. Enforced SDVOSB rule-of two for VA procurements via GAO bid protests and letters to contracting officers. 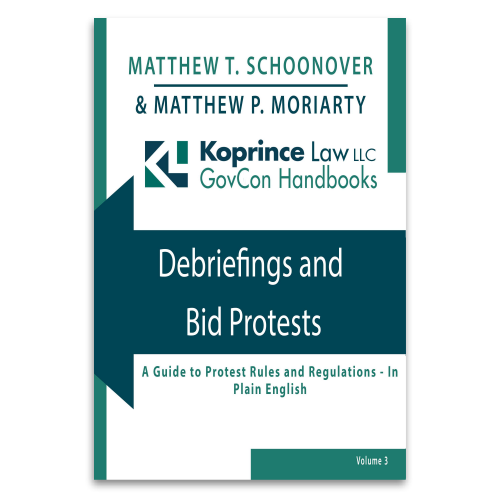 Defended against bid protest in connection with EPA software services procurement. Garnered a corrective action after protesting that an agency must refer matters regarding small-business contractor responsibility to the SBA for a certificate of competency. Successfully argued that an agency must maintain its follow-on or renewable procurements under set-aside programs under the “Once 8(a) Always 8(a) Rule”; the agency took corrective action. Successfully responded to SBA area office size protests alleging identity of interest affiliation under familial connections and ostensible subcontractor theory. Successfully challenged size of awardee under nonmanufacturer rule. Defended against SBA OHA CVE protests of SDVOSB status. Defended OHA Appeals, including analysis of issues such as ostensible subcontractor affiliation under the primary and vital and unusually reliant tests. Drafted joint venture agreements to assist small business concerns in qualifying for certain set-aside contracts for which they cannot qualify on their own. Revised LLC operating agreements to ensure compliance with control, negative control unanimity requirements, and affiliation issues under SBA regulations. Reviewed reseller agreements to ensure compliance with applicable limitations on subcontracting and the nonmanufacturer rule. Reviewed ownership interest purchase agreements to address issues of potential affiliation between buyer and seller. Prepared memoranda to advise clients in the following set-aside areas: SDVOSB, 8(a), HUBZone, cost principles, limitation on subcontracting, and affiliation. Assisted in review of All-Small Mentor Protégé Agreements to better meet SBA’s goals in light of mentor and protégé assistance and needs.